Pharmaceuticals: can’t live with them; can’t live without them. Drugs are a big part of our society, and drug companies are constantly in the news. Moreover, with an upcoming presidential election, Medicaid is a major issue. That said, Steven James has picked a great topic with which to launch a new series and a new protagonist, Jevin Banks. Banks is an enigmatic character, one not normally associated with carrying the burden of a lead character in a mystery novel. An escape artist turned exposé filmmaker, Jevin Banks teams with a unique cast of supporting characters, and together they launch a secret investigation into the world of neurological research funded by a major drug company and the federal government. A heady topic to be sure, and sometimes the book bogs down in places with a bit too much scientific lingo and an overabundance of wild hypotheses, yet the story holds our interest because of its many nefarious antagonists. A set of identical twins capable of using their minds to compel others to act against their own instincts creates some interesting scenarios. Can one person’s individual consciousness nonlocallly affect another person’s awareness, thoughts, or physiology? That’s the basis of the research Banks and his team endeavor to decipher. In the process of the team’s investigation, several exciting incidents take place, allowing the reader to forgive the author for the science overload we’ve been previously subjected to. 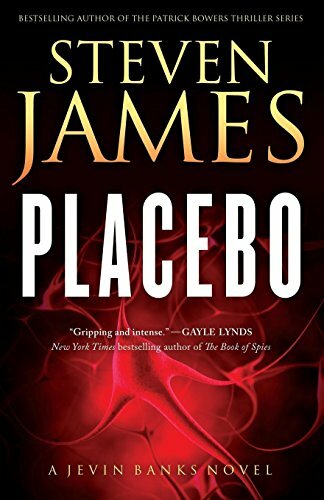 Mind-to-mind communication coupled with a nefarious pharmaceutical company, plus a few fight scenes, an arson, a hired killer, and a voodoo practitioner—all contribute to making Placebo a thought-provoking and thrilling mystery. Or is the book simply a placebo, making you think it’s engrossing? You decide.